238 pages | 26 B/W Illus. 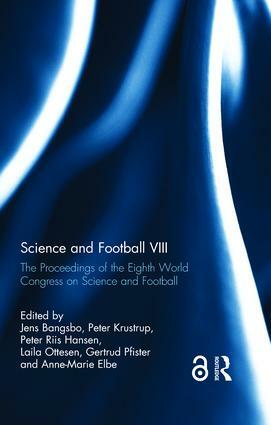 Science and Football VIII is an essential resource for all sport scientists, trainers, coaches, physical therapists, physicians, psychologists, educational officers and professionals working across the football codes. Jens Bangsbo is Professor in Human Physiology and Exercise Physiology in the Department of Nutrition, Exercise and Sports at the University of Copenhagen, Denmark. Peter Krustrup is Professor in Human Physiology in the Department of Nutrition, Exercise and Sports at University of Copenhagen, Denmark. Peter Riis Hansen is Consultant Invasive Cardiologist at Gentofte University Hospital, Denmark, and Associate Professor of research at the University of Copenhagen, Denmark. Laila Ottesen is Associate Professor in the Department of Nutrition, Exercise and Sports at the University of Copenhagen, Denmark. Gertrud Pfister is Professor Emeritus in the Department of Nutrition, Exercise and Sports at the University of Copenhagen, Denmark. Anne-Marie Elbe is Associate Professor for Sport Psychology in the Department of Nutrition, Exercise and Sports at the University of Copenhagen, Denmark. Read Chapter 6 - Open Access. Open Access content has been made available under a Creative Commons Attribution-Non Commercial-No Derivatives license.